We’re weeks away from the start of spring and, of course, mother nature decides to drop a big load of sn*w (hey, it’s a four-letter word in Minnesota by March) all over us. 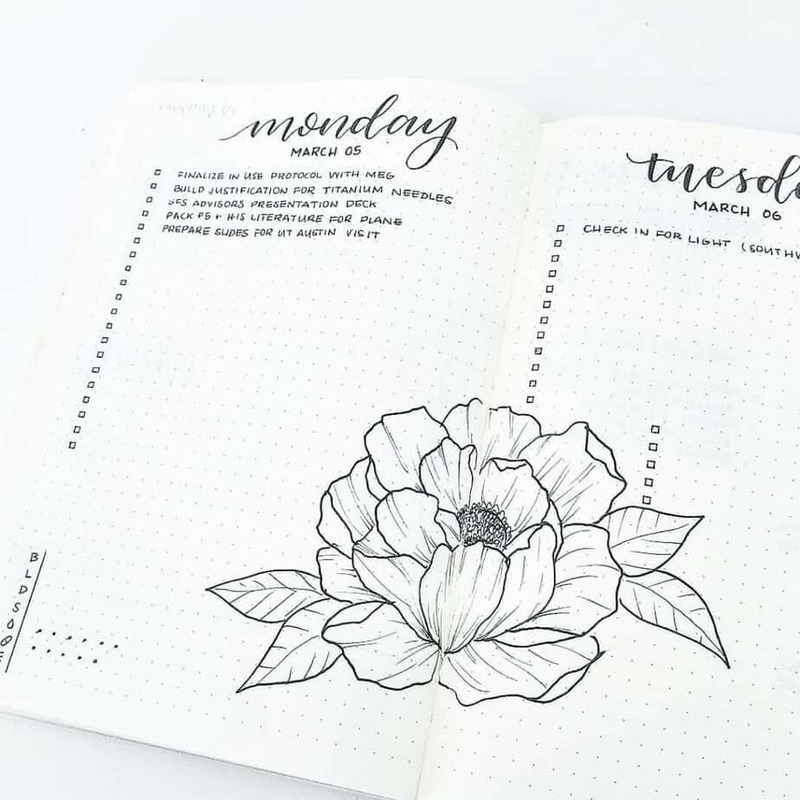 Despite the messy inconvenience, I can still gear myself up for the spring season in my bullet journal by drawing flower doodles. 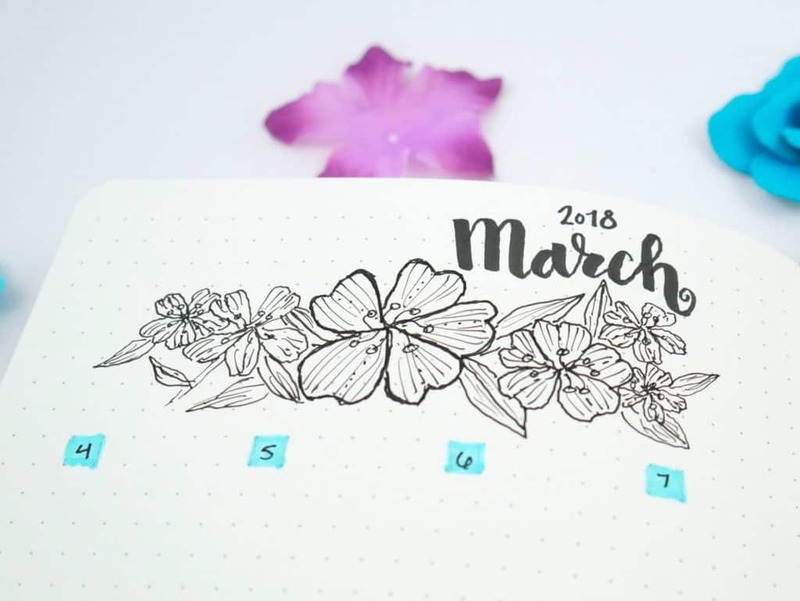 Drawing flowers is one of my favorite ways to decorate my bullet journal spreads. 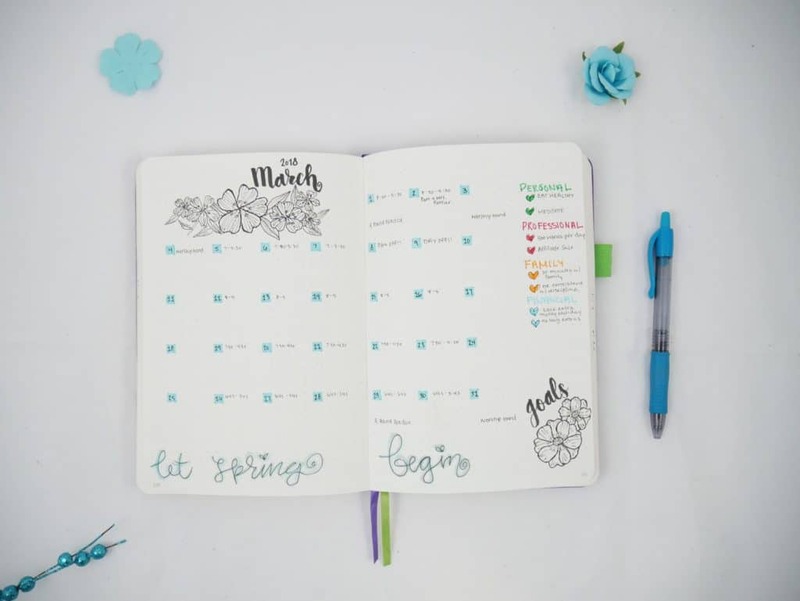 As evidenced by social media, a lot of other people love decorating their bullet journals with flowers as well! 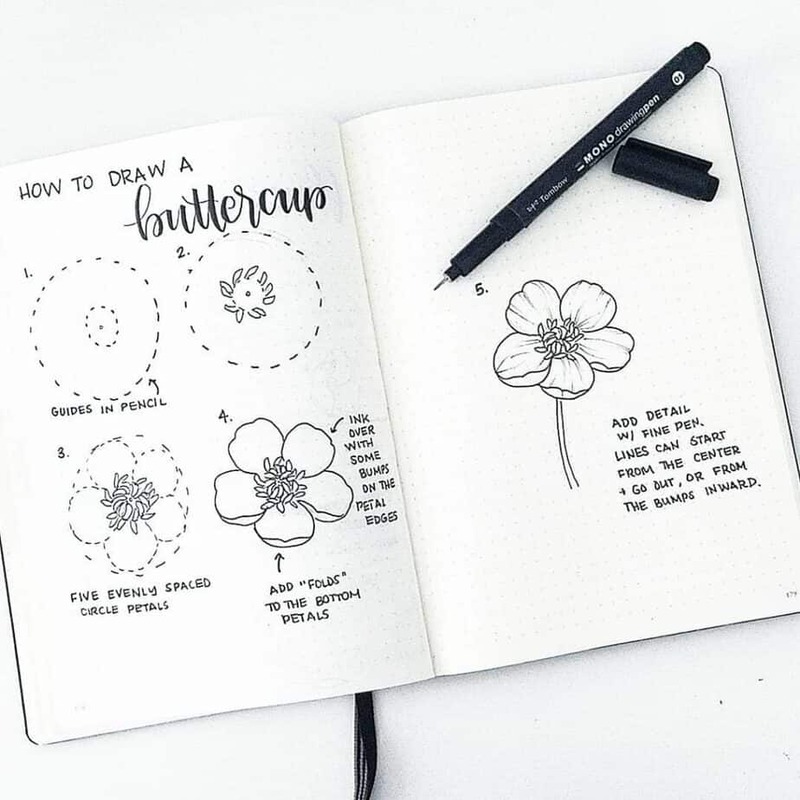 Well, I’m no expert artist, and for a long time, I actually avoided drawing flowers in my bullet journal because I never liked the way they turned out. Sometimes they looked too cartoony. Other times, the proportions and layout wouldn’t pan out the way it did in my head. 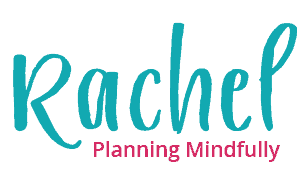 Right around the time I started Planning Mindfully, I followed this amazing woman named Liz on Instagram. 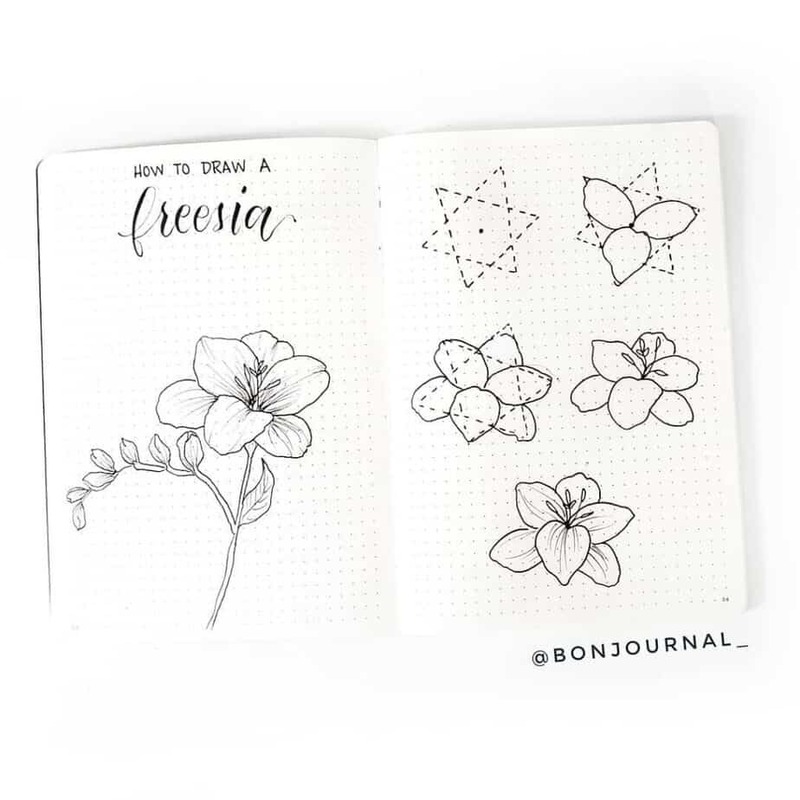 Liz runs an amazing account there over at @bonjournal_ and she keeps a very lovely feed full of bullet journal goodness. Liz is absolutely incredible at drawing sophisticated flowers. 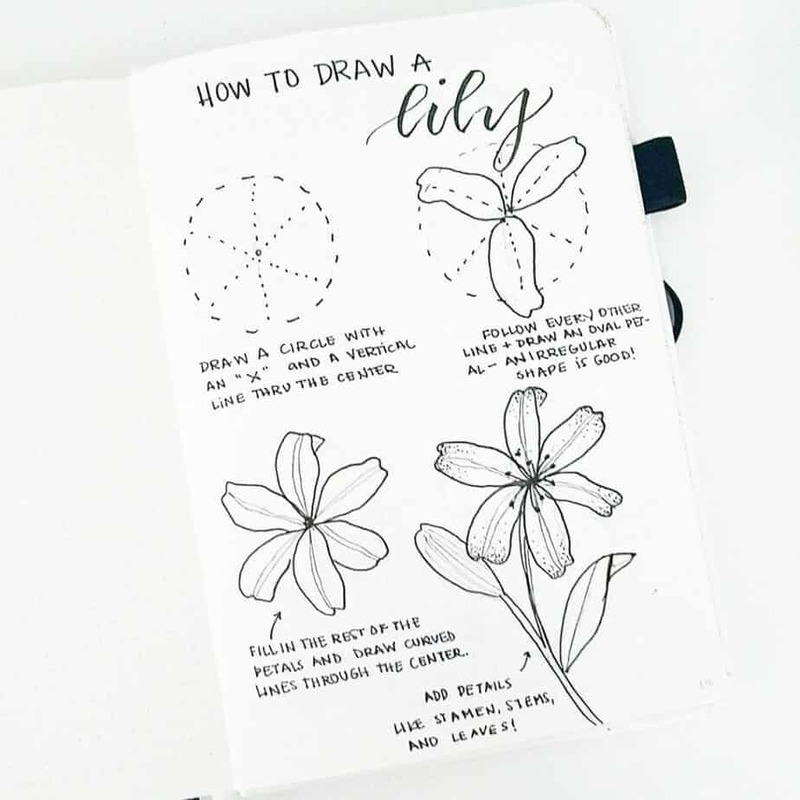 What makes Liz extra special, however, is her ability to break down her flower drawings into super easy steps. It’s no wonder she’s so popular because she’s been able to inspire so many artists and bullet journal accounts alike. She has 105,000 followers on Instagram… she’s THAT good. 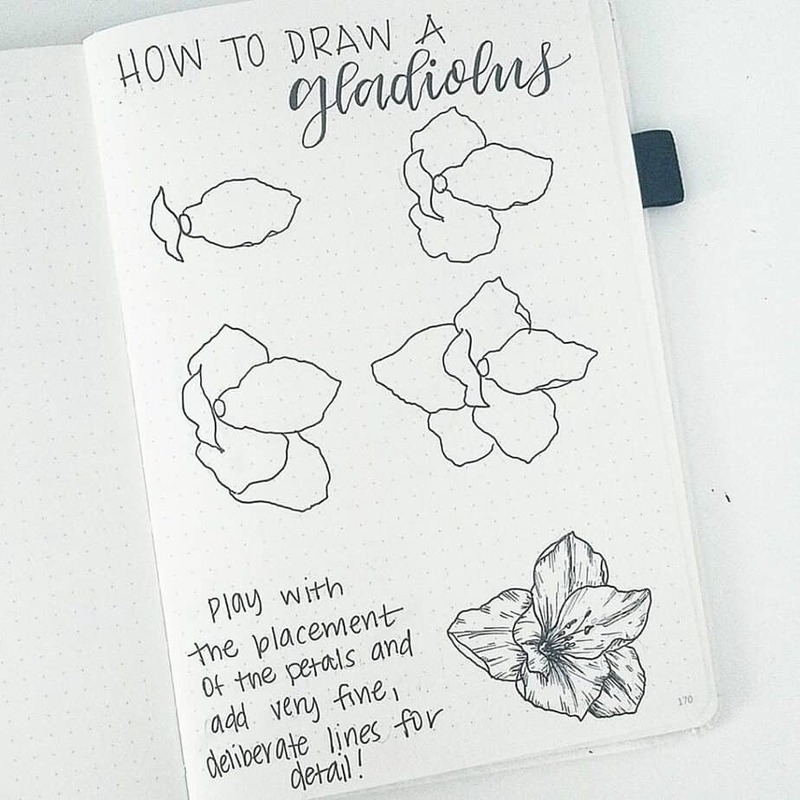 Everybody loves her beautiful flowers and simple instructional posts! 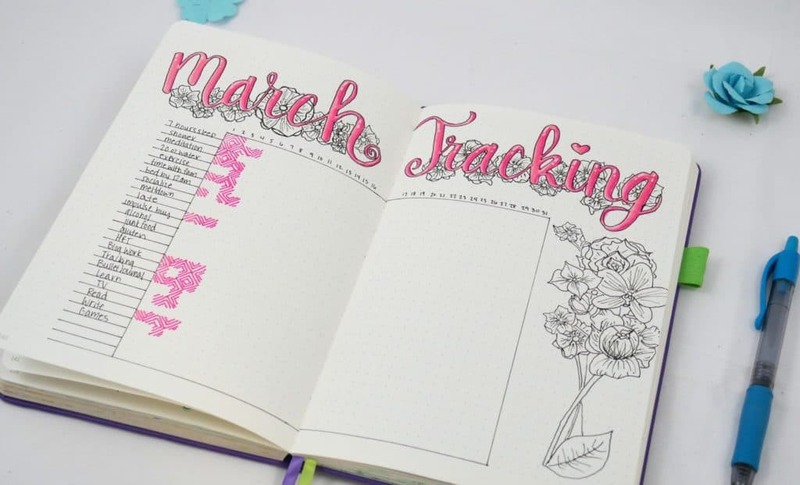 It’s a large reason why she’s one of the 18 most inspirational bullet journal accounts of 2018! With spring around the corner, I knew I had to ask Liz if I could share her amazing work with all of you! And thankfully, she said yes! 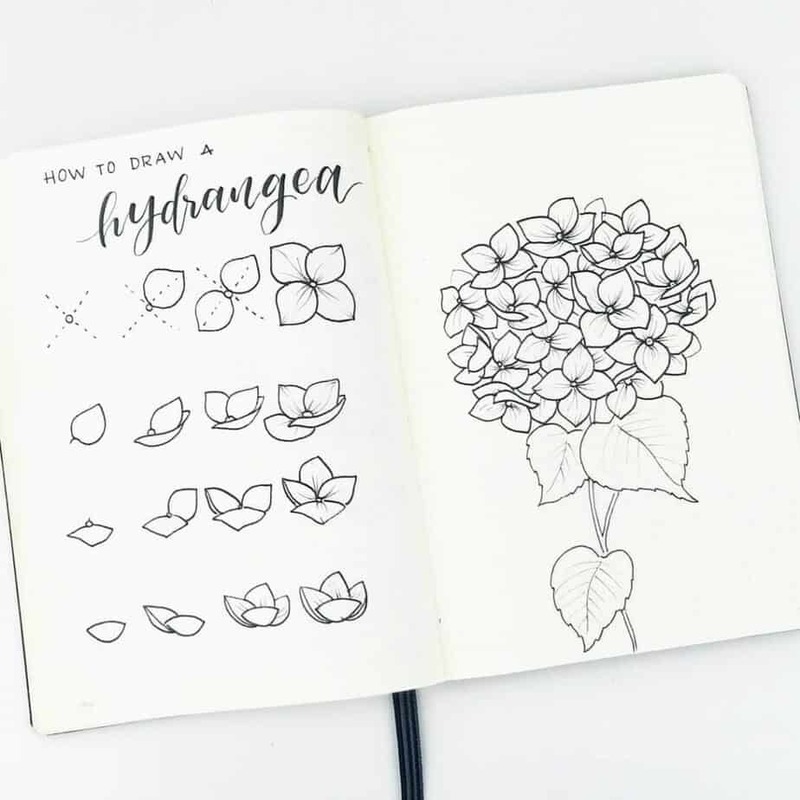 Since much of her Instagram feed is either floral bullet journal posts or how to draw flower tutorials, I asked her a little bit about why she focuses on these two particular themes. Here is what she had to share! Some of my best childhood memories are watching my grandmother paint. She was extremely talented and could paint landscapes and portraits, but her favorite thing to paint was watercolor flowers. This may explain my passion for drawing flowers! I’ve been drawing since I was little, but these days, the opportunity to sit down and be a real artist are few and far between. 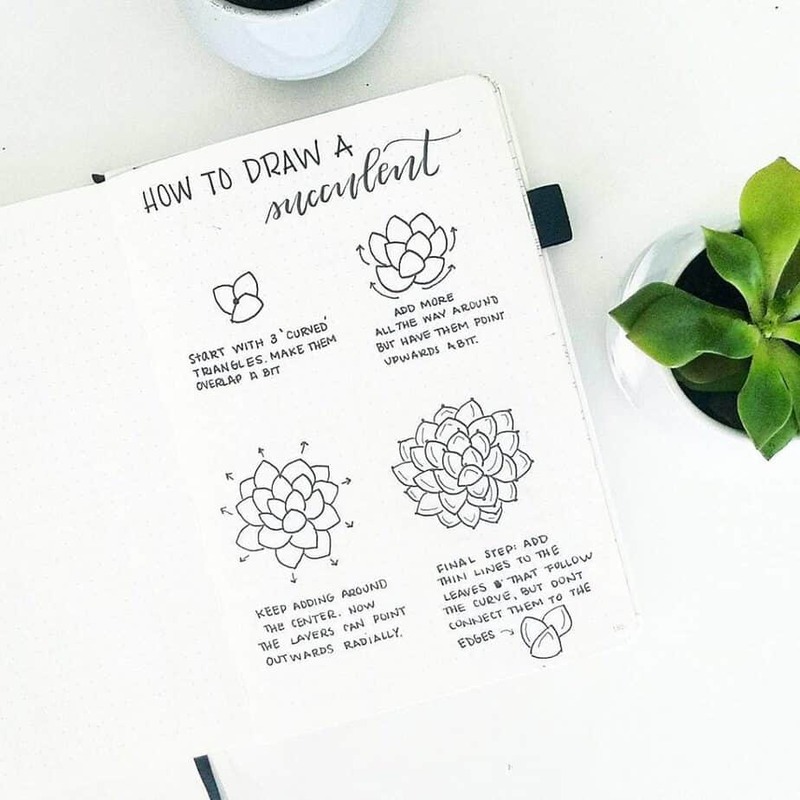 That’s why I’ve incorporated flower art into my bullet journal – it serves me both as a planner and a creative outlet. 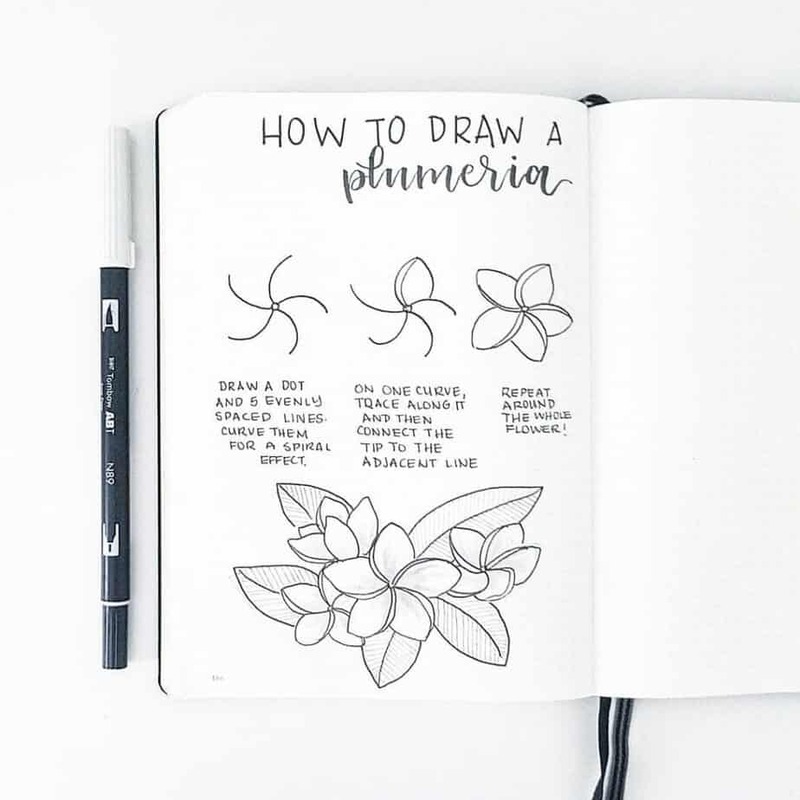 Art brings me so much joy, and after joining the Bullet Journal community on Instagram, it seemed like there were so many others that wanted to use their journals in a similar way. Hence – the flower tutorials! The best part about creating the “How-to-draw” series (and the main reason that I continue posting) is all of the amazing comments and messages that I get. A mother once messaged me to tell me that she and her daughter do my tutorials together every week. Others say that they never thought they could draw a stick figure, much less a beautiful flower! I’m so happy to be able to give back to everyone in this way – I love seeing everyone’s beautiful results (tag me, use #bonjournal, or message me!). And of course, I’m always taking requests! And if you’d like to follow Liz, you will find her at @bonjournal on Instagram, Facebook, and on Youtube! For now, let’s get to drawing! Drawing amazing flowers takes a little patience and a lot of simple technique. The best flowers often focus on creating the simpler shapes first, then adding the detail later. If you’d like to follow the techniques that Liz uses to make her flowers, I’d highly recommend investing in a high-quality pencil and an eraser. These particular bullet journal supplies help with fixing mistakes and drawing general shapes prior to going over them in pen. You may wonder why it’s even worth doing rough drafts of these doodles, but speaking from experience, it helps you develop a better eye for form and structure. Eventually, you may be able to ditch the pencil and eraser as you get better. For ease of instruction, I will include the instructions below each image. All instructions in her images are left to right, top to bottom. 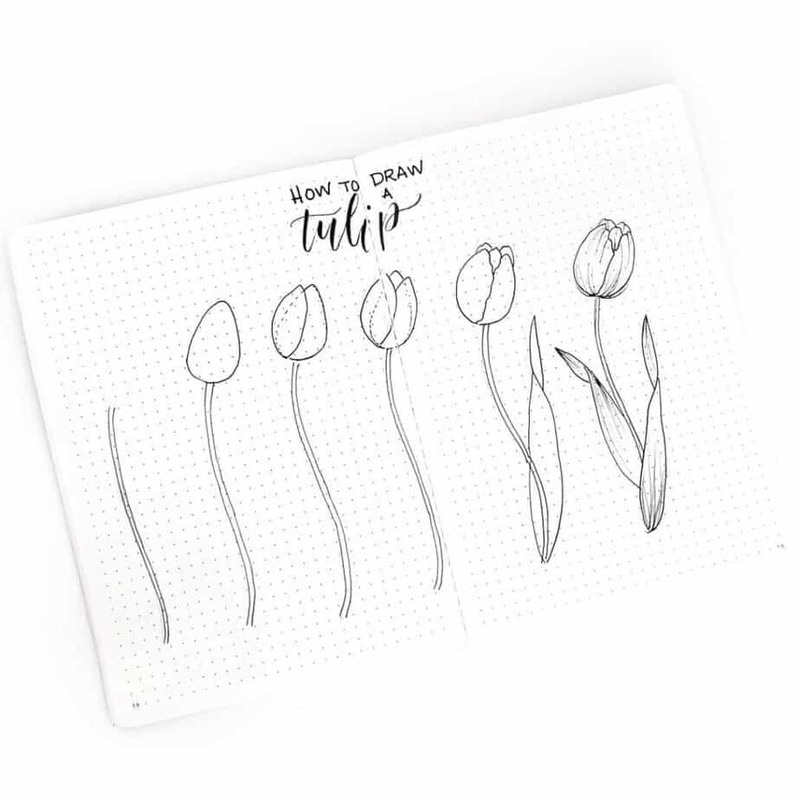 Let’s get started on learning how to draw a flower easy. First, start with three concentric circles as a guide. Fill in the smallest circle with dots, then add a few petals. Add more petals until you like the shape. Add dots around the middle circle. Connect the dots with lines to the center. Doing this in pencil will help tremendously if you’re just beginning. As you complete the flower, you will want to erase the remnants of the concentric circles. Draw a circle with an “x” and a vertical line through the center. Follow every other line and draw an oval petal- irregular shapes are good! Fill in the rest of the petals and draw curved lines through the center. Add details, such as the stamen, stems, and leaves. One of the nice things about drawing flowers is that there is no such thing as ‘perfect’. You can have a few jagged or irregular shapes, and it can still look amazing! Start with 3 ‘curved’ triangles. Make them overlap a bit. Add more curved triangles all the way around but have them point upwards a bit. Keep adding more curved triangles around the image, this time the layers can point outwards radially. Final step: Add thin lines to the leaves. Have the lines follow the curve, but don’t connect them to the edges. While a succulent isn’t necessarily a ‘flower’, it is a plant! Plus, I know how well-loved they are to draw in the bullet journal community! This particular image doesn’t contain very detailed instructions, however, it’s pretty straightforward to follow. You can adjust the location of the petals and arrange the shapes. Play with the placement of the petals, and add very fine, deliberate lines for detail. Start with a ‘baby flower’, then add dotted lines pointing out from the middle of each petal. Do not draw the line inside the ‘baby petal’, only outside. Add 5 petals, and give them some angles. Continue until you’ve drawn petals around the flower. Add dotted triangles to each petal. Draw a curved triangle in a dotted line in pencil. Make an oval on the middle inner base of the triangle, and create ‘bunny ears’ on the top of the oval. Add three additional petals; one in the middle of the ‘bunny ears’, and two outside of each bunny ear. Add curves to the insides of the petals, then add a stamen and stem. Start with berries (one small circle, and five circles around that circle). Add the beginnings of petal stems all around the drawing. Add 3-4 small petals, spaced out. Make them fat, wobbly, and make sure the petals have pointy tips. Add larger petals, connecting them to the unused petal stems from step 2. Start with guides (in pencil). Draw a circle, then two leaves off the upper right hand side of the circle. Put defined dots evenly over each petal, as this will create the ‘points’ for the holly leaves. Connect the dots with arced lines. Add several overlapping circles for berries (this is done in the middle of the dotted circle). This image doesn’t feature explicit instructions but does include four different types of ways to draw the flowers. Keep in mind each flower includes four round petals; each petal ends in a point. Hydrangeas feature many of these smaller flowers in a cluster, much like what is shown on the right page. 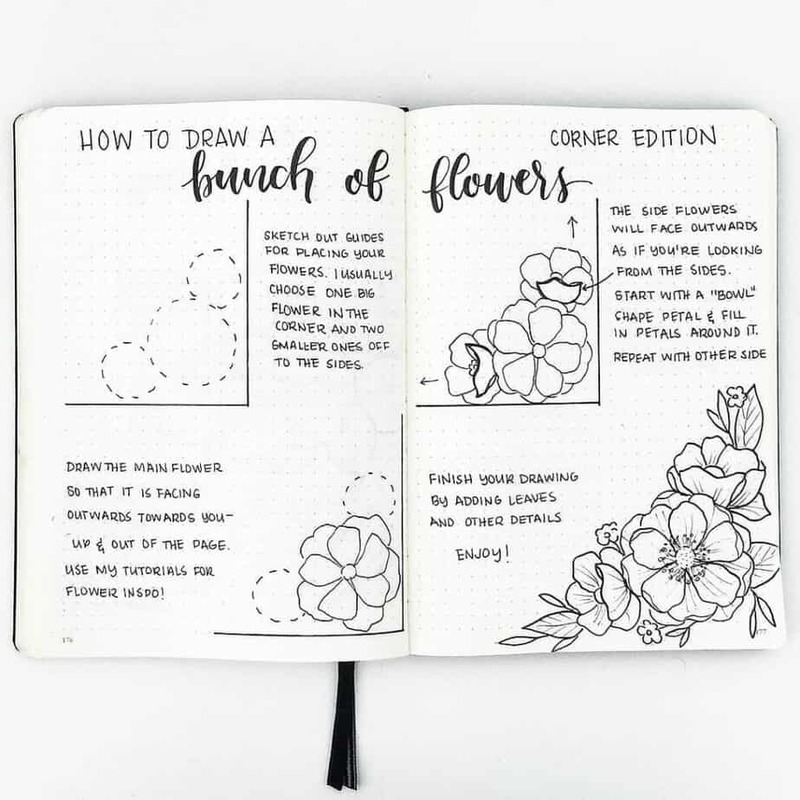 If you don’t feel confident creating the clusters, there is a section further down the post on how to draw multiple flowers together. Create three guide circles in pencil. On the middle guide circle, create small oblong ovals that point toward the outside guide circle. Then add more of the oblong ovals in the middle, filling in the middle section of the flower. Create five evenly spaced circle petals. Ink over with some bumps on the petal edges, and then add folds to the bottom petals. Add detail with a fine pen. Lines can start from the center and go out, or from the outer ‘bumps’ inward. Five dotted line guides that curve slightly. Add petals; make them elongated ovals with a bump at the end. Add small curved lines from the center, then add small dots to the end of the curved lines. 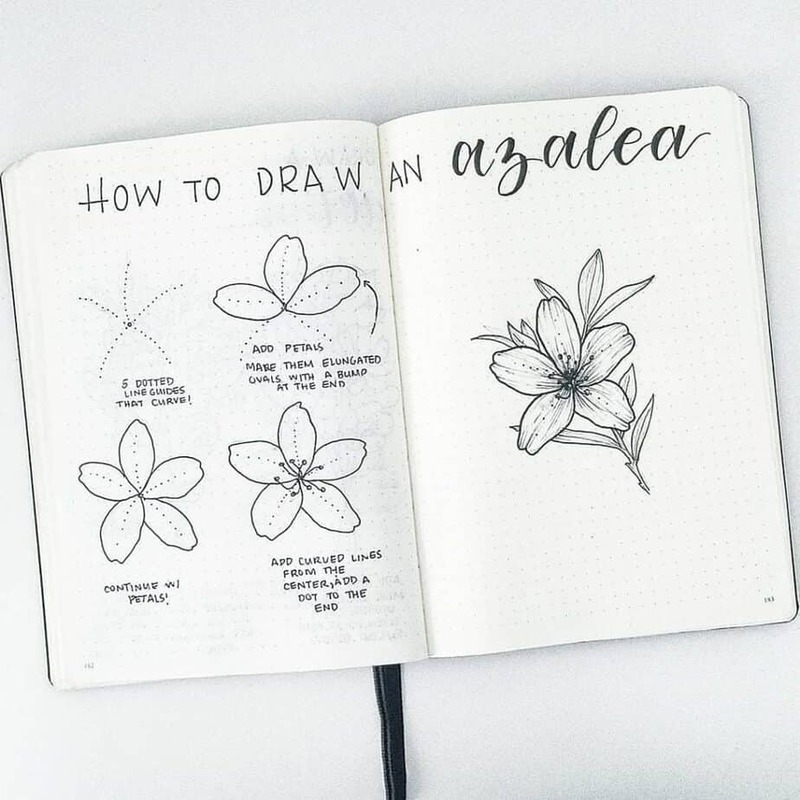 Liz actually has a video on how to draw this exact same flower, so if you’d like to see how to doodle an azalea, watch below! Start with a small bud. Start adding more petals by making an arc shape. Have each new petal overlap the last. Keep building with petals until you choose to stop! I love how you can make this flower as large or a small as you want. It’s really interesting how this flower looks very complicated to draw, but broken down into steps it’s actually quite simple. Draw a dot and five evenly spaced lines. Curve them for a spiral effect. On one curve, trace along it and then connect the tip to the adjacent curved line. Repeat around the whole flower! Draw one to two petals around the first petal. These can be of any size. Add a final petal, then add details. As you can see, the instructions aren’t very specific as a sweet pea is a simple flower that can have a different look depending on the angle you choose to draw. 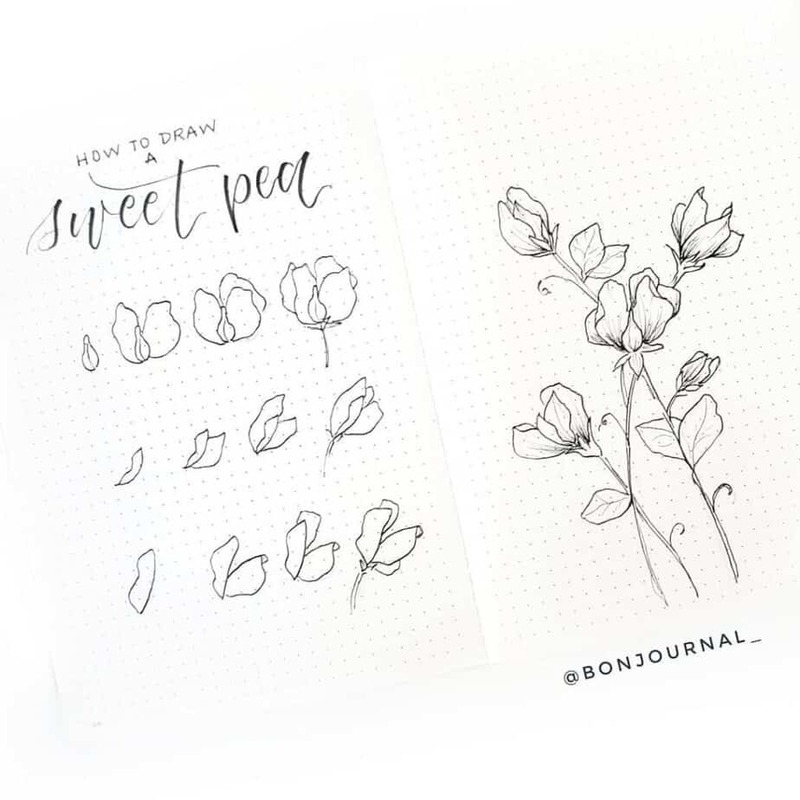 Liz added a few variations of sweet pea flower drawings for you to see how you can change up this simple, sweet floral design. Draw a long stem as two parallel lines. Add an oblong oval at the top of the stem. Draw another oblong oval to the side of the first oval. Include a small, rounded triangle in the middle of the two ovals. Add similar small, rounded triangles above the original two ovals, then add a long leaf to the bottom of the stem. Draw a circle outline, then create a small upside down heart in the center of the outline. Add two little circles to the top of the upside down heart, then draw a large petal going around the bottom of the heart. The petal should be within the original circle outline. Add two petals on the right and left, also going to the tip of the circle outline. Then add one petal that doesn’t quite combine the petals to the side. Last, add a petal connecting the other two petals. 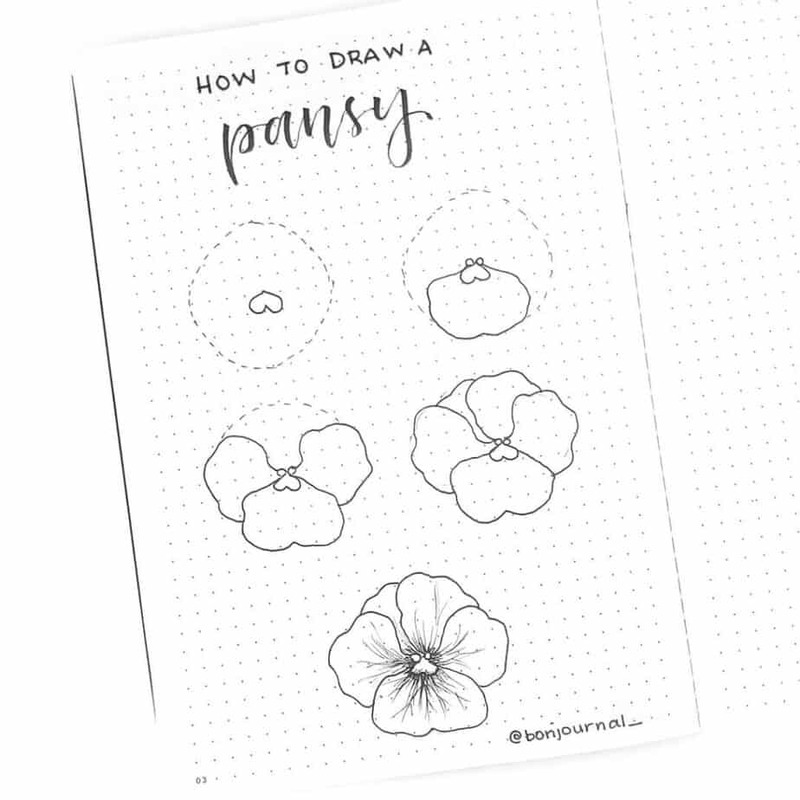 Add details to complete the pansy drawing. Draw the outline of a hexagram. Create three petals from the center and going out to three edges of the hexagram outline. Add the other petals to the unused edges of the hexagram outline. Last, create the details, stem, and leaves. Draw a circle outline, then draw the shape of a gumdrop along inside the outline. Create six petals around the gumdrop. The petals on the rounded part of the gumdrop will be shorter, while the petals on the flat edge of the gumdrop will be longer. Add petals in the spaces between the six petals. Add many small dots within the gumdrop space and add details to the petals. 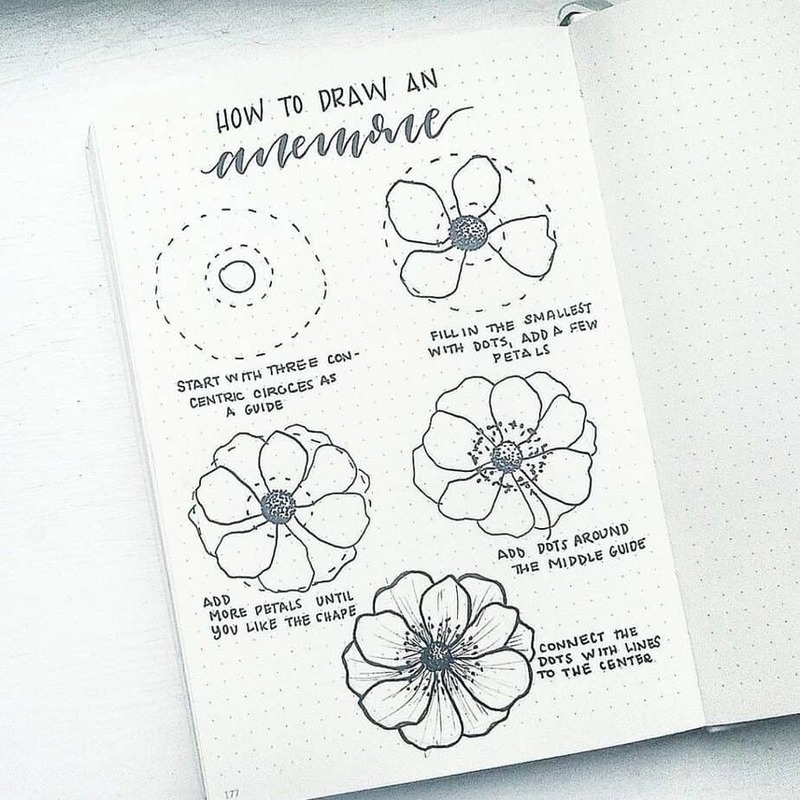 So you have drawing individual flowers down, which is amazing! 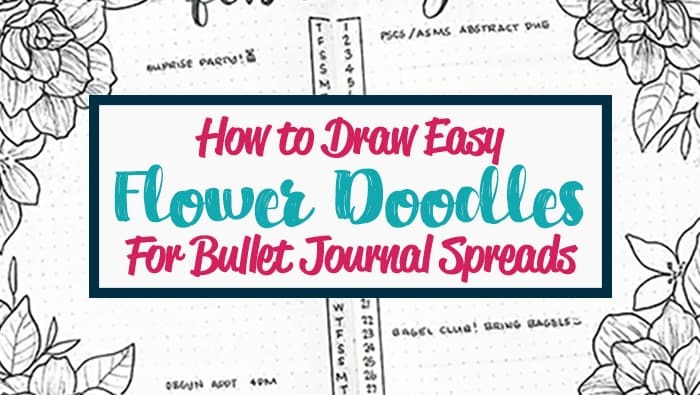 You may want to create floral banners or bouquets in your bullet journal spreads. While the concepts of drawing the flowers are relatively similar, there are some key differences in how to lay out the flowers next to each other. 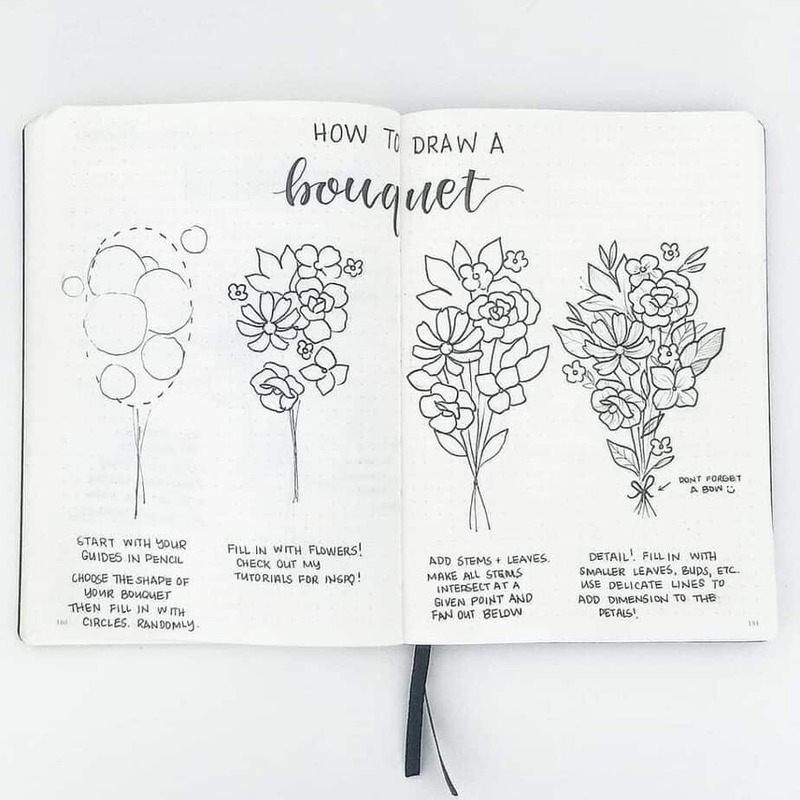 Sketch out guides for placing your flowers. I usually choose one big flower in the corner and two smaller ones off to the sides. Draw the main flower so that it is facing outwards towards you. The side flowers will face outwards, as if you’re looking at the flower from the side. Start with a “bowel” shape petal, and fill in petals around it. Repeat with other flower. Finish your drawing by adding leaves and other details! While this is geared toward corners of pages, the concept is relatively simple to grasp and you could do bunches on any part of a page. Start with your guides in pencil. Choose the shape of your bouquet, then fill in the guide circle with random, smaller circles of varying sizes. Fill in the inner circles with any type of flower. Add stems and leaves. Make all stems intersect at a given point and fan out below. Detail! Fill in with smaller leaves, buds, etc… use delicate lines to add dimension to the petals. If you’d like, you can add a bow! 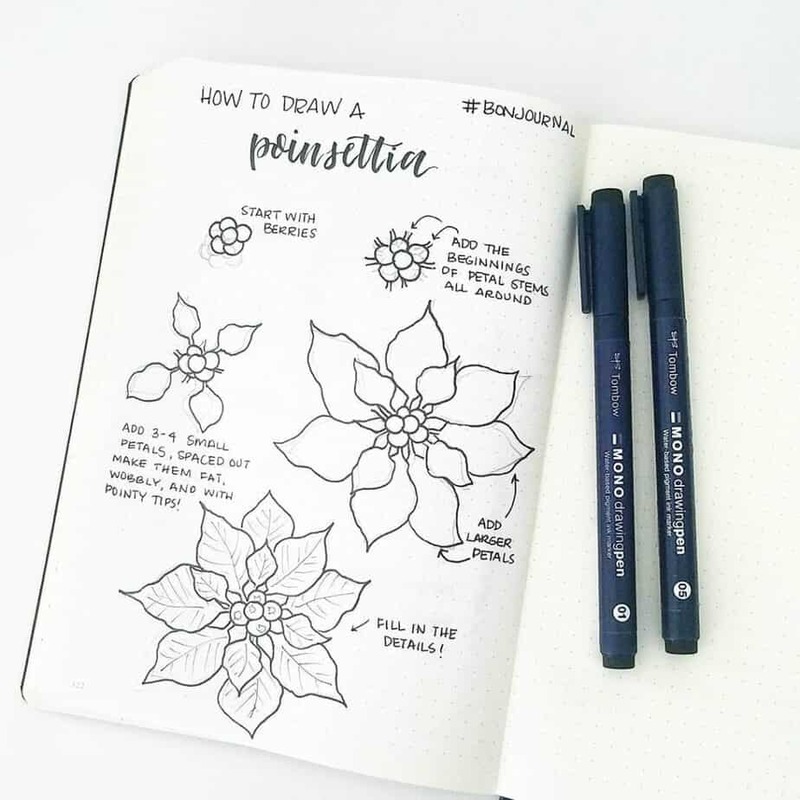 Start with creating a basic flower drawing. Give petals irregular shapes and wobbly edges. Give the flower petals some folds and add a curved line to the edge. 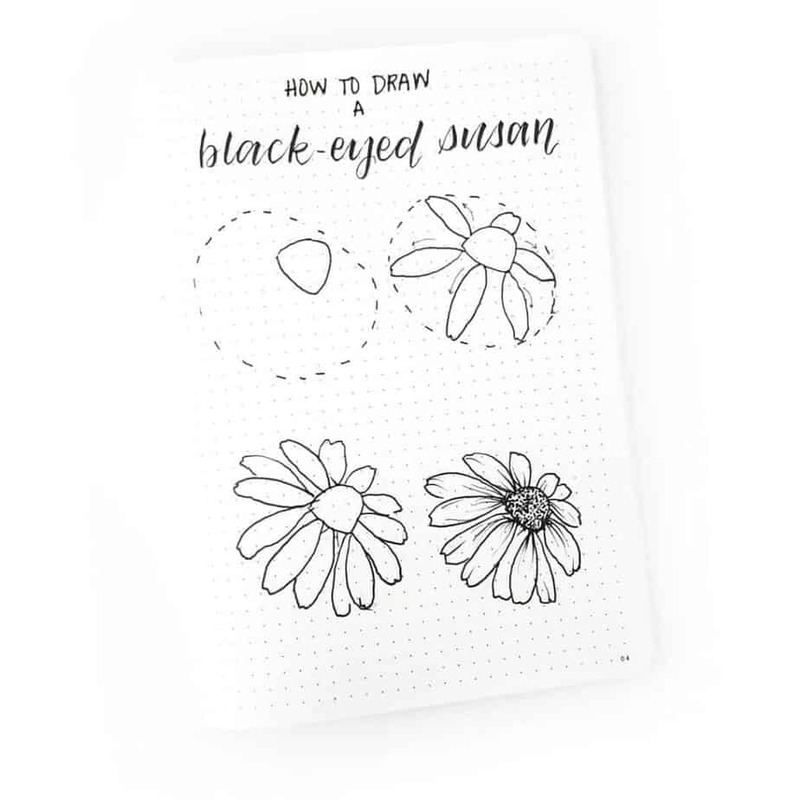 Add depth to the flower doodle by drawing curved lines coming from the center. Repeat the same step as above with smaller curved lines from petal tips going in. Add circles to the center of the flower. Last, add the stem and the leaves. 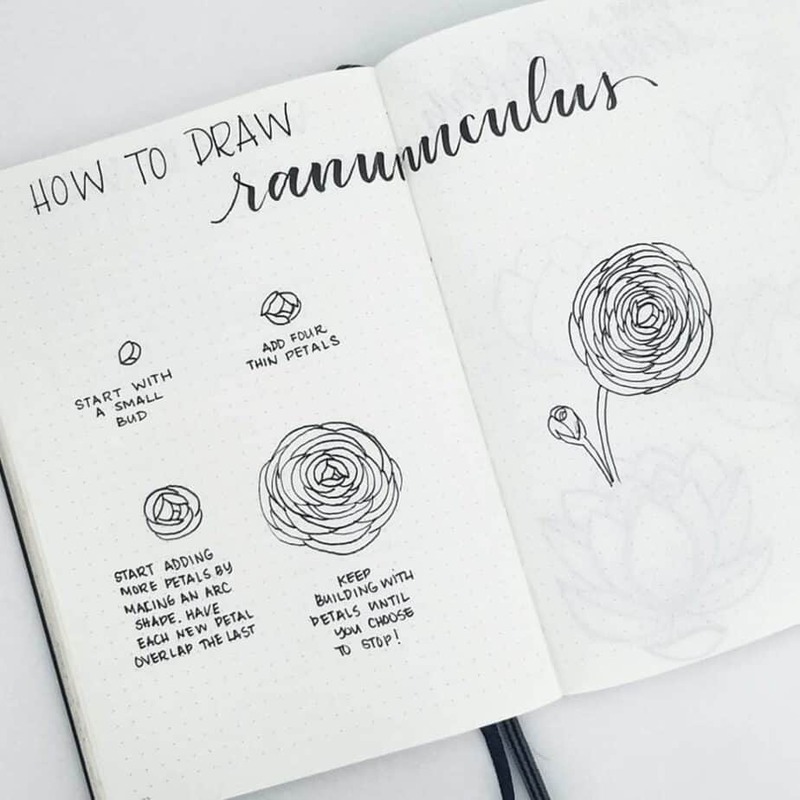 Remember, too, that this advice can also be give to any of the flower doodle tutorials in this blog post! Are These Flower Drawings Simple? So after looking at all of these beautiful flowers and corresponding instructional guides, I set out to create a spread of my own! I wanted to see for myself how easy it would be to recreate these beautiful tutorials. All in all, I had a blast making these spreads. 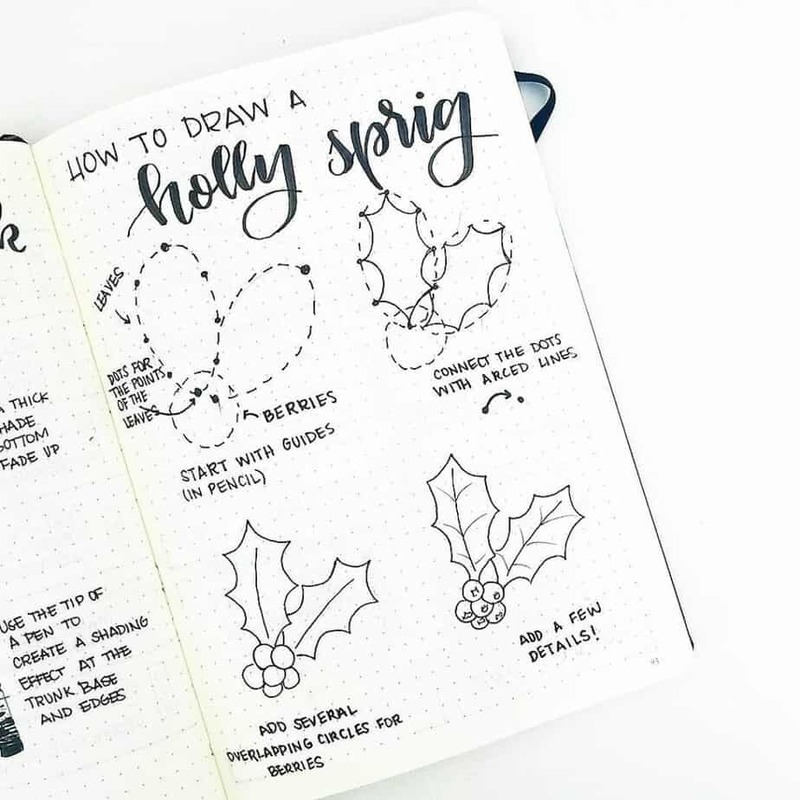 They are by far some of my best bullet journal layouts I’ve created, and I have Liz to thank for her incredible floral doodle art tutorials! 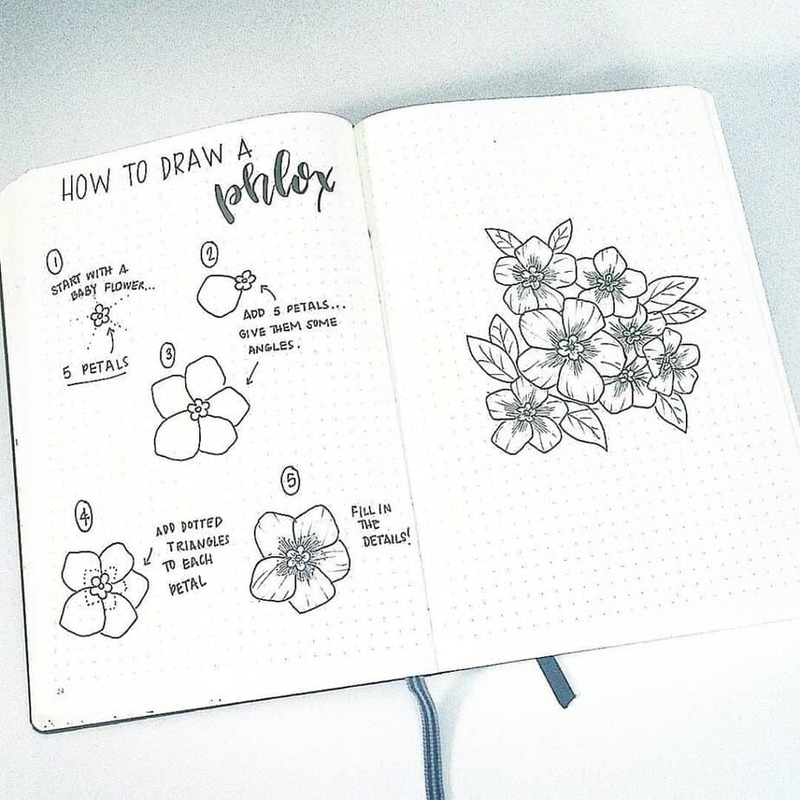 I loved these easy drawing ideas for flower doodles. 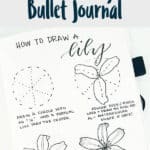 Decorating your bullet journal is one of the most fun parts of using a bullet journal! At the same time, it can also be one of the most challenging aspects. 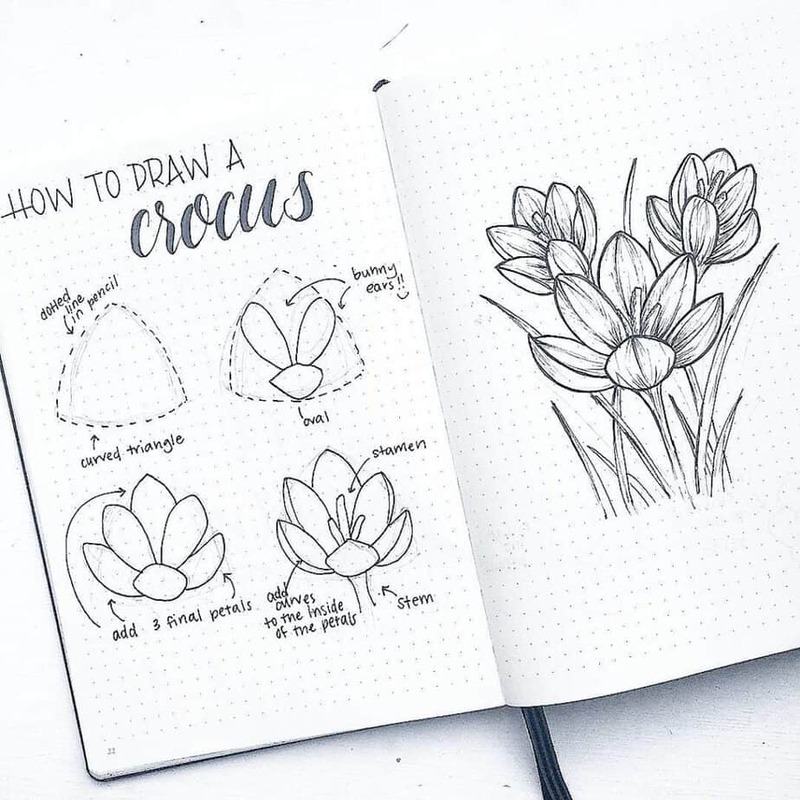 Thankfully, there are many other resources to look toward if drawing flower doodles isn’t your forte. If you’d still like to draw, there are amazing ‘how to draw’ books. Another bullet journal friend of mine created a few books for holidays. 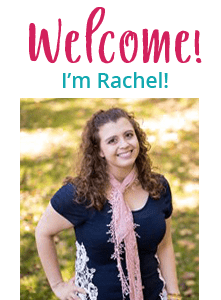 If you’d like to learn more, you can read that review and my personal experience using her doodle books here! Additionally, if you’d love to draw, but find either that art isn’t your forte or that you don’t have time for all of these details, there are other options if you’d still like to add some flair or beauty. 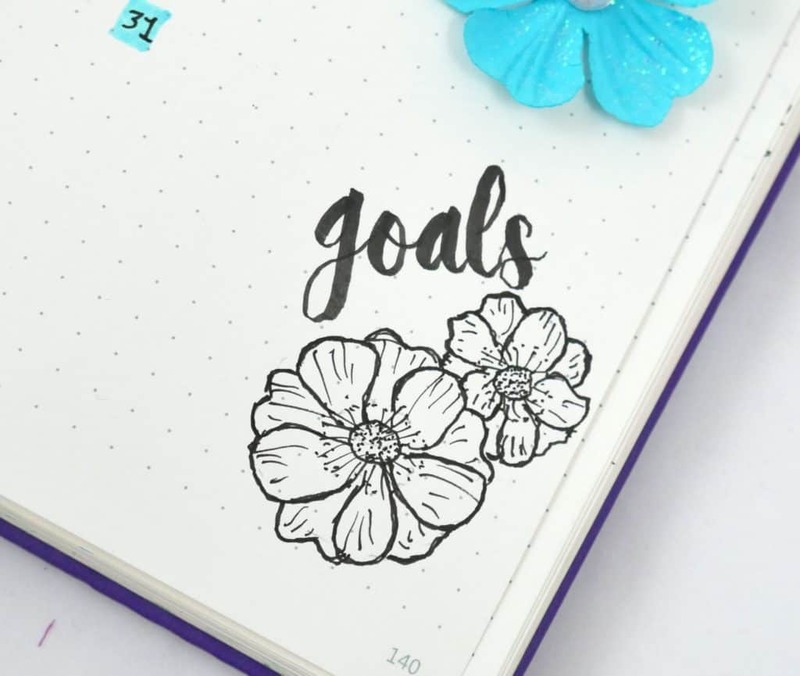 You can use stickers, stamps, and stencils to simplify your bullet journal spreads! 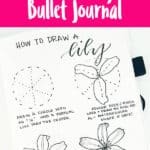 Here are some helpful ways to simplify your bullet journal setup, including simpler techniques for creating beautiful flower drawings in your bullet journal! 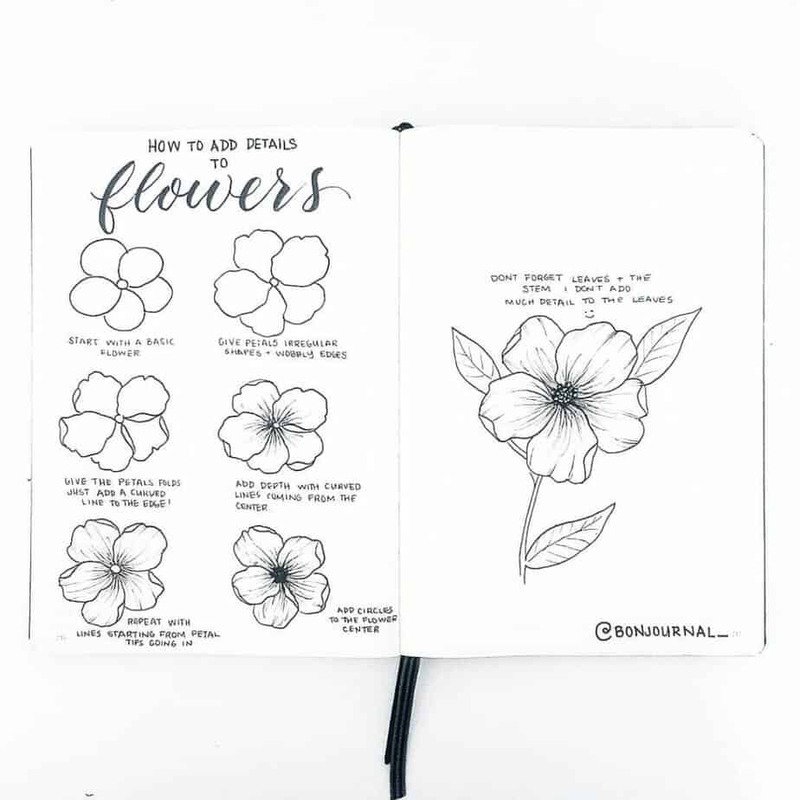 What is your favorite flower to draw in your bullet journal? Tell me in the comments!!! Maybe we can get some more suggestions for Liz to make some epic tutorials. Thanks, I can’t wait to try these flowers! Do you sell a booklet of your tutorials? The children in my class are always learning about botany and I love your work. Any advise would be greatly appreciate to incorporate your teaching into an elementary classroom of 1-3rd graders. 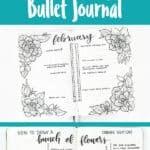 Wonderful method of teaching for those of us just beginning the journey of bullet journaling! Thank you!! Easy to follow instructions which I shall be trying out. Thanks. Gracias por compartir los detalles para poder dibujar bellas flores. Fabulous tutorial. Thank you very much. I just sat down and tried most of these! I think this post along with your one about the different monthly page ideas inspired me to start bullet journaling! It’s so fun and I think it will help me stay more organized lol! Hi Thandi! That’s great, these tutorials really are so inspirational. I hope your bullet journaling journey is going well!